For an assignment in the Coursera (MOOC) Class ‘Wind, Waves and Tides‘ by the University of Toronto (Nov 2014). The north coast of Scotland is sparsely populated, especially to the west of Thurso and Wick, which lie at the north-east corner. These towns are connected to the cities in the south by the A9 road, a railway line and a 275 KV electrical transmission line . 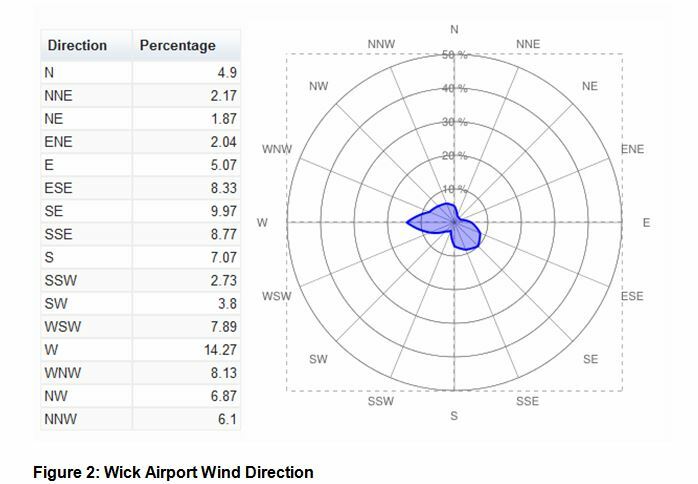 The wind data for Wick Airport (10m mast) shows an average wind speed of 5.7 m/s. The wind is mostly from the west and south-east . The national UK wind map gives average wind speeds as 6.8 m/s at 10m, 7.7 m/s at 25m and 8.3 m/s at 45m, and these computer model values are a little higher than measured . The area is in a prime location for wind turbines and many have been built within convenient distance from the high voltage grid connection. Scottish planning law, in line with European Union directives, requires that all developments are assessed for environmental impacts . Initially a screening process examines if the proposal may have any serious environmental impacts. If potential environmental risks are uncovered, a full Environmental Impact Assessment (EIA) is required. Factors taken into consideration include the overall size of the development and cumulation with other developments in the vicinity, use of natural resources, production of waste, pollution and nuisance. Special attention is given to conservation of wild birds, habitats, flora and fauna. On the whole, the UK is welcoming of renewable energy development. A poll conducted in 2013 found that 70% of people were in favour of wind farms being built locally . Another poll found that 51% positively supported government assistance for wind energy projects . 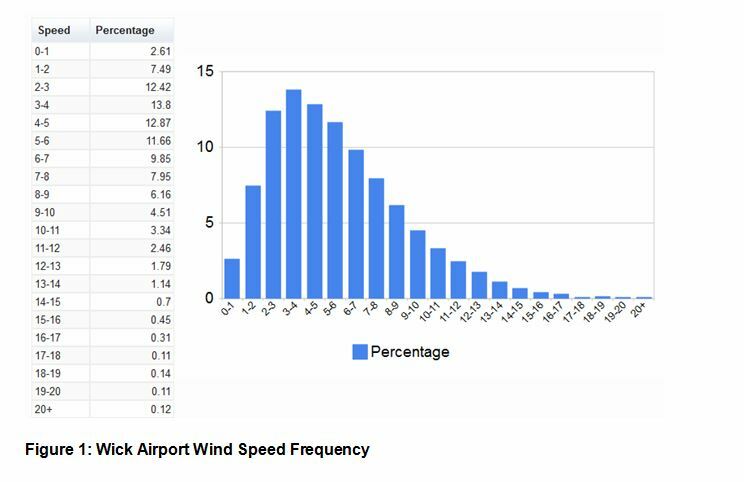 During a feasibility study for a community wind turbine in my area, the majority of people were in favour of the turbine. The biggest negative response was from tourists who were keen on preserving the views. In general, I think that most people see the need for clean energy development in order that we reduce CO2 emissions and combat global warming. The question of siting wind farms and NIMBYism issues can largely be resolved by good public consultation and the inclusion of community benefit schemes. It seems fair that any community willing to host wind turbines, with associated issues of noise, electromagnetic interference, construction disruption and altered landscape, should also benefit from the development, over and above the national collective benefit of generating carbon free electricity. The Scottish government has published ‘Good Practice Principles for Community Benefits from Onshore Renewable Energy Developments’ . The benefits are not solely financial, and an ongoing and active role in the development of local renewable energy is encouraged. Other benefits which the developer provides to the community, funding of other projects, or a local energy discount scheme. The guide recommends that a minimum community benefit of £5k ($8k) per installed megawatt be offered in annual payment to the fund. 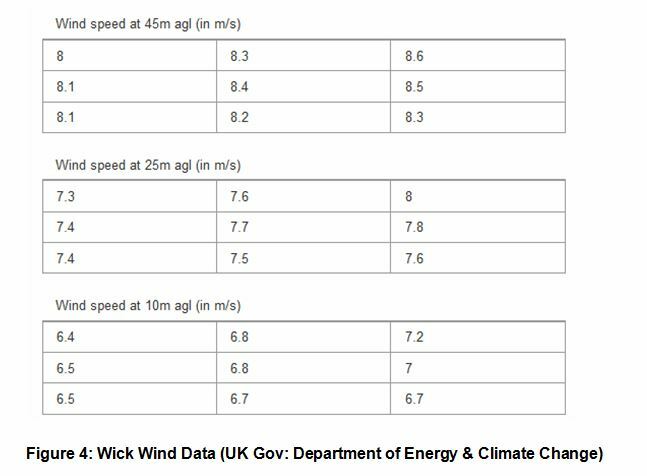 ‘Wick UK Wind Speed Data’, UK Government, Dept of Energy & Climate Change.